The living room is meant to be the heart of any home, that one room in the house where occupants arguably spend the most time and which should reflect warmth and comfort as well as reflect the personalities of the owners. 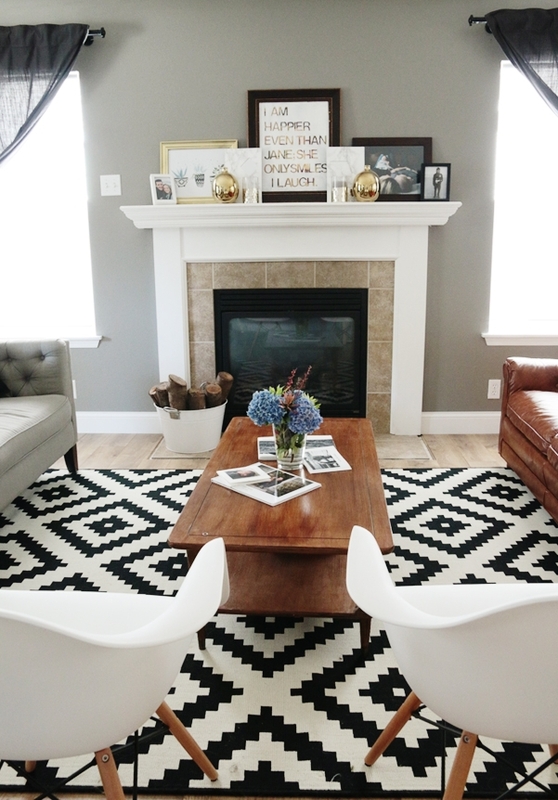 To day we bring you a living room remodel which takes a modern/minimal theme and fills it with warmth. 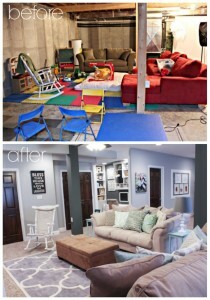 When Karisa and Michael ( www.petitemodernlife.com) were expecting their son, they realized the need for more space. The sold their first home and purchased their second house while she was pregnant with their child. The structure had been built in the last decade and had no structural issues to deal with, so it all became making changes to claim the new space as their own. The new mommy nesting instinct was strong in Karisa; almost immediately upon moving in she threw herself into making over the new house. She painted all the interior walls and trim, supervised the removal of the lovely, but hard to keep clean light, beige carpet replacing it with hardwood flooring (taking advantage of a sale at Costco at $1.40 per square foot!) Once these basics were taken care of, they became the canvas upon which Karisa and Michael could paint the colors of their new life. The new house may not have been a fixer-upper, but that didn’t mean that it offered no challenges to the new couple. 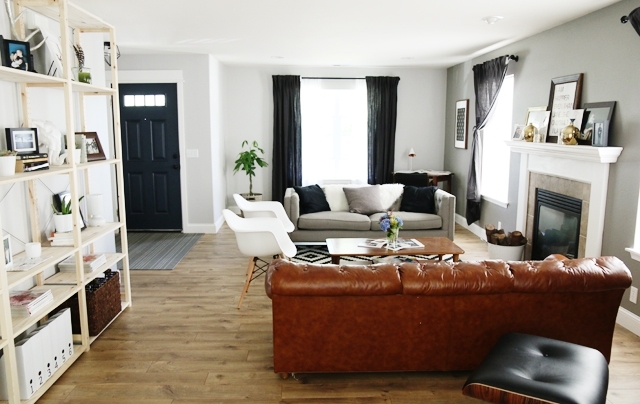 One issue with the home was the fact that the front door opened directly on the living room, and in order to reach the dining room, it was necessary to walk through the long and narrow living area. Since traffic would be a constant with this layout, it became important not to impede its flow with too much awkwardly placed furniture. But it was also important to preserve the homey feel that is desirable in any living room. Both Karisa and Michael are fans of modern functional interior design; the clean lines and industrial vibe resonate with them. Rather than overfill their new home with a lot of heavy furnishings they opted for key pieces that communicated functionality but still exuded warmth. They made some very canny and judicious purchases, utilizing such diverse sources as Craiglist (sofas, desk, desk chair! ), Ikea’s showrooms and “as-is” sections (Ivar modular shelving, tiered shelving for their entryway; chairs, geometric area rug and decorative elements) and Wayfair (chairs) . They also retained tried and true pieces from their first home, including the sturdy and stylish dining room table they purchased when they first got married. Furniture placement was concentrated around the fireplace that takes place of honor in the long and narrow room. Two sofas dominate the space, equivalent in size they differ in upholstery; one is distressed leather, the other soft tufted grey fabric. The couches face each other over a coffee table with a $99 dollar Ikea area rug placed underneath. Chairs, from a heavy Eames lounger recliner to lightweight armless side chairs cluster around these pieces, a small desk, lamp and chair, the latter complementing the look of the Eames lounger, are tucked into a nearby corner. But wait, mere words can’t do justice to the beauty of the transformation! 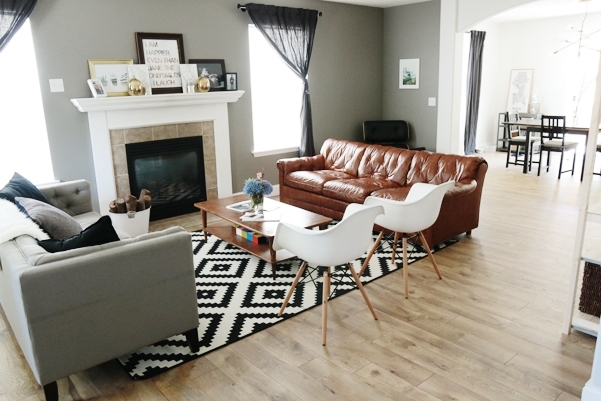 Go have a look at the blog living room post to enjoy the full flavor of this shoestring budget (Karisa provides a cost breakdown), million dollar look makeover!